Indications exist that paramagnetic calcium phosphates may be able to promote regeneration of bone faster than their regular, diamagnetic counterparts. In this study, analyzed was the influence of paramagnetic cobalt-substituted hydroxyapatite nanoparticles on osteoporotic alveolar bone regeneration in rats. 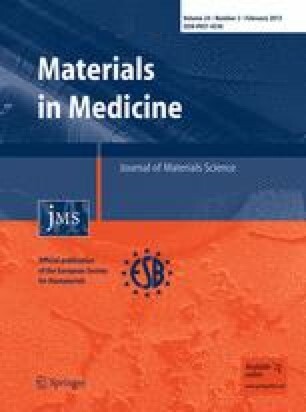 Simultaneously, biocompatibility of the material was tested in vitro, on osteoblastic MC3T3-E1 and epithelial Caco-2 cells in culture. The material was shown to be biocompatible and nontoxic when added to epithelial monolayers in vitro, while it caused a substantial decrease in the cell viability as well as deformation of the cytoskeleton and cell morphology when incubated with the osteoblastic cells. In the course of 6 months after the implantation of the material containing different amounts of cobalt, ranging from 5 to 12 wt%, in the osteoporotic alveolar bone of the lower jaw, the following parameters were investigated: histopathological parameters, alkaline phosphatase and alveolar bone density. The best result in terms of osteoporotic bone tissue regeneration was observed for hydroxyapatite nanoparticles with the largest content of cobalt ions. The histological analysis showed a high level of reparatory ability of the nanoparticulate material implanted in the bone defect, paralleled by a corresponding increase in the alveolar bone density. The combined effect of growth factors from autologous plasma admixed to cobalt-substituted hydroxyapatite was furthermore shown to have a crucial effect on the augmented osteoporotic bone regeneration upon the implantation of the biomaterial investigated in this study. The research presented in this paper was supported by the Ministry of Education and Science of the Republic of Serbia under the Project No. III45004 and by the NIH/NIDCR grant K99-DE021416. Confocal microscopy data for this study were acquired at the Nikon Imaging Center at University of California, San Francisco. FE-SEM images were obtained by courtesy of Dr. Srečo Škapin from Jožef Stefan Institute. Authors would also like to thank MSc. Ljilijana Veselinović for XRD measurements.